For the baseball player, see Josh Morgan (baseball). Morgan at the Bears training camp in 2014. Joshua Lewis Morgan (born June 20, 1985) is an American football wide receiver who is currently a free agent. He was drafted by the San Francisco 49ers in the sixth round of the 2008 NFL Draft. He played college football at Virginia Tech. He also played for the Washington Redskins and Chicago Bears. Morgan played quarterback, wide receiver and cornerback at Eastern Senior High School in Washington, D.C. before transferring to H.D. Woodson High School for his senior year. During his senior season, he accumulated eight catches for 275 yards and three touchdowns in a game against Glen Mills (Pa.) High School. He passed for 987 yards and rushed for 898 during his junior year, and finished with five passing and eight rushing touchdowns. He also played basketball and was named the most valuable player in two of the tournaments his team participated in. Morgan ranks fourth in Virginia Tech history with 122 receptions, eighth with 1,817 receiving yards (a 14.9 avg.) and fifth with 16 touchdowns. He finished his career with 2,435 all-purpose yards. During his senior season in 2007, Morgan led the team with a career-high 46 catches for 552 yards (a 12.0 avg) and five touchdowns, while playing alongside Eddie Royal, now with the San Diego Chargers, and Justin Harper, now with the BC Lions. In 2006, he finished second on the team with 33 receptions for 448 yards (a 13.6 avg.) and four touchdowns. As a sophomore in 2005, he finished with 28 catches for 571 yards (a 16.8 avg.) and four touchdowns. During his freshman season in 2004, he caught 15 passes for 346 yards (a 23.1 avg.) and three touchdowns. Morgan’s 126 yards receiving vs. Auburn in the 2005 Sugar Bowl set a school bowl game record. Morgan at 49ers training camp in August 2010. In 2008, Morgan's preseason performances won him a place on the final 53-man roster. He became ill just before the season and lost 15 pounds. Morgan made his NFL debut in Week 1 against the Arizona Cardinals. In Week 7 against the New York Giants, he caught five passes for 86 yards and scored his first touchdown. The week after, he had his first career start. After suffering a one-inch tear in his groin in November, he missed the next four games. Playing in only 12 games, Morgan showed real promise as he finished his rookie season with 20 receptions for 319 yards and three touchdown receptions. Morgan was made a starter by Week 1 of the 2009 season. In October, after the 49ers had finally signed their 2009 first-round draft pick (wide receiver Michael Crabtree), it was assumed that Morgan might lose his starting job to the rookie. Instead, Morgan retained his starting position and played alongside Crabtree. By the end of his second season, he played in all 16 games, starting 15 of them, and recorded 52 receptions for 527 yards and three touchdowns. In his third season, Morgan recorded a career high of 698 receiving yards on only 44 receptions. He also scored two touchdowns. On October 11, 2011, Morgan was placed on the injured reserve list after a promising start to the 2011 season due to a broken bone in his right leg. He finished the season with 15 receptions, 220 yards, and one touchdown in just five games. Morgan at the Redskins' training camp in 2012. Morgan signed a five-year contract worth $12 million for the first two years, $7.5 million of which guaranteed, and the last three years voidable by the Washington Redskins on March 13, 2012. By the start of the 2012 season, he was named the second starting wide receiver opposite of Pierre Garçon after competing with Leonard Hankerson for the starting flanker position. In Week 2 against the St. Louis Rams, he was penalized for unsportsmanlike conduct during the Redskins' two-minute drive attempt in the fourth quarter to tie with or beat the Rams. After catching a pass on a third down and being tackled by Cortland Finnegan, Finnegan shoved Morgan while he was getting up and put his hand in Morgan's face. Morgan reacted by throwing the ball at Finnegan and the Redskins were then given a 15-yard penalty. Redskins kicker Billy Cundiff then attempted a 62-yard field goal on fourth down, missing and leaving the final score 31-28. Morgan was later fined $7,875 by the NFL for the penalty. On a play where Robert Griffin III rushed for 12 yards, the ball popped into the air as he was tackled, Morgan caught the ball and ran it 13 yards for a touchdown in the Week 13 win over the New York Giants. In the next game against the Baltimore Ravens, he scored his first receiving touchdown of the season. Morgan took over as the team's kick returner in place of struggling rookie Chris Thompson. Originally named the starter at the start of the season, he lost his starting position to Hankerson. For the first time in his career he was benched after being listed as inactive in Week 11. The following week, he returned to his starting position after Hankerson was moved to injured reserve. On April 21, 2014, Morgan agreed to a one-year deal with the Chicago Bears after the Redskins chose not to pick up the last three years of his five-year contract. Morgan signed with the New Orleans Saints on May 17, 2015. He was released on September 5 for final roster cuts before the start of the season. Growing up in Washington D.C., Morgan was a fan of the Washington Redskins, along with his family, during his childhood and formative years. ↑ "Virginia Tech Football Records". Retrieved 23 May 2013. ↑ Matt Maiocco. "Crabtree likely to start Sunday's game". Press Democrat. Retrieved 2009-10-27. ↑ "Josh Morgan out with broken leg". ESPN.com. October 10, 2011. Retrieved 2012-08-14. ↑ Maske, Mark (March 13, 2012). "Redskins sign 49ers WR Josh Morgan". WashingtonPost. Retrieved 2012-03-13. ↑ Jones, Mike (September 3, 2012). "Redskins depth chart: WR Josh Morgan listed as starter opposite Pierre Garcon". WashingtonPost.com. Retrieved 2012-09-11. ↑ Jones, Mike (September 17, 2012). "Redskins-Rams: Five observations from Sunday's loss". WashingtonPost.com. Retrieved 2012-09-17. ↑ Jones, Mike (September 16, 2012). "Josh Morgan: 'I should've just kept my calm'". WashingtonPost.com. Retrieved 2012-09-17. ↑ Jones, Mike (September 17, 2012). "Mike Shanahan doesn't plan to discipline Josh Morgan". WashingtonPost.com. Retrieved 2012-09-17. ↑ Campbell, Rich (September 21, 2012). ""Out of hand" Redskins-Rams game results in at least $55,000 in fines". WashingtonTimes.com. Retrieved 2012-09-23. ↑ Tinsman, Brian (December 4, 2012). "Morning After Stats Recap: Redskins-Giants". Redskins.com. Retrieved 2012-12-10. ↑ Tinsman, Brian (December 10, 2012). "Monday Morning Stats Pack: Redskins-Ravens". Redskins.com. Retrieved 2012-12-10. ↑ El-Bashir, Tarik (October 19, 2013). "Morgan embraces new role in return game". CSNWashington.com. Retrieved 2013-11-11. ↑ Tinsman, Brian (November 15, 2013). "Hankerson Seizes Second Receiver Job". Redskins.com. Retrieved 2013-11-21. ↑ McNally, Brian (November 26, 2013). 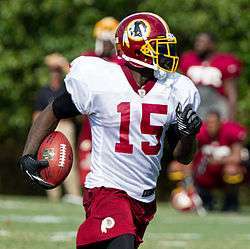 "Redskins wide receiver Josh Morgan rebounds from benching". WashingtonTimes.com. Retrieved 2013-11-27. ↑ "Bears sign WR Josh Morgan". ESPN.com. April 21, 2014. Retrieved 2014-04-21. ↑ Woodbery, Evan (May 17, 2015). "New Orleans Saints sign veteran receiver Josh Morgan, according to source". nola.com. Retrieved May 17, 2015. ↑ Fitzgerald, Gary (March 15, 2012). "In Search of Stability, Morgan Comes Home". Redskins.com. Retrieved 2012-03-15. 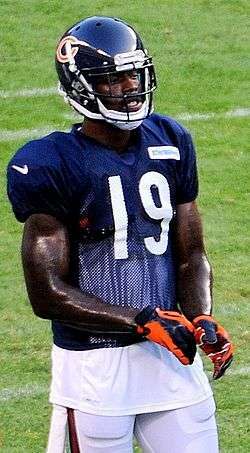 Wikimedia Commons has media related to Josh Morgan.